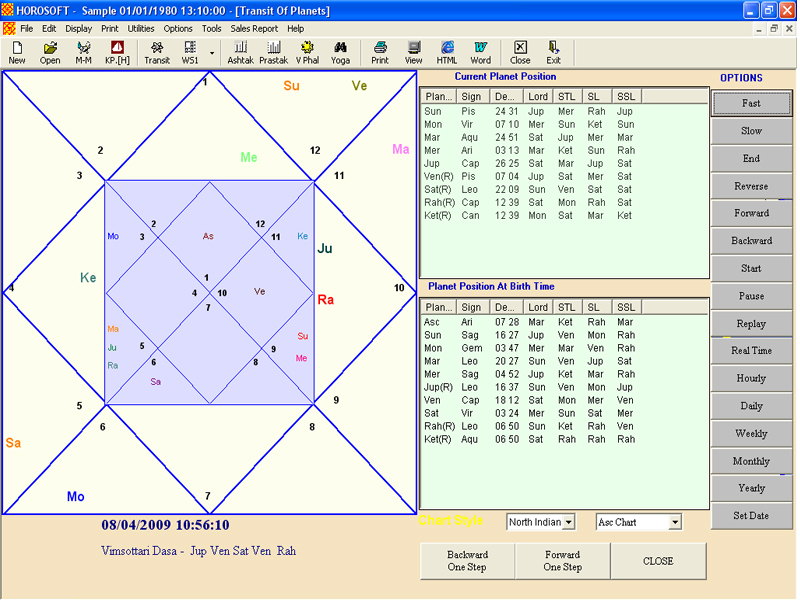 HOROSOFT Professional Edition 4.0 astrology software, based on the Hindu system of Indian Vedic astrology, is specially designed for Professional astrologers, astrology bureaus and for those who wish to generate Horoscopes for business purposes. This professional astrology software is useful for astrological instutions, professional astrologers, research scholars, who have a large number of clients and work on an international platform. Horosoft Professional Edition is an Vedic advanced astrology software which consists of various graphical worksheets, animated transit of planets, customization options and provides you with detailed calculations, minute analysis and predictions along with many other exclusive features. This edition includes K.P.astrology, Nadi astrology, Lal Kitab astrology, Jamini, Predictive astrology Etc. Birth Time in Ghati, Sunrise, Sunset, Day-Duration, Bhayat, Bhabhog, Balance of Dasha, Avakhada / Ghat Chakra, Lucky Day, Stone, Color Etc, Samvat, Lunar Paksha, Lunar Tithi Etc. Details of Karaka, Avastha and Tara Chakra, along with Moon Chart. Yogini, Kalchakra, Kalchakra Pratyanter, Ashtottari, Ashtottari Pratyanter, Char Dasha, Vimshottari Dasha, Antar, Pratyanter & Shooksham. Char Dasha, Char Karak, Karakamsha Chart, Swamsha Chart, Pad Lagna, Jaimini Aspect. Lord and Sub-Lords of Planets, Planetary Position according to Lagna or according to 1-249 Nos., Prime Significators, Aspects, General Significators with Star Lord, Niryana Cusp Etc. A brainchild of Mr. Umang Taneja which is based on theory of Lord and Sub Lords of Planets, Co-Ordinates of Planets, Niryana Cusps Etc. Lal Kitab Basic Details, Lal Kitab Friendship Details, Lal Kitab Dasha, Lal Kitab Teva, Lal Kitab Ancestral Curse, Lal Kitab Predictions of all 12 Planets, Remedies, Yearly Chart Etc. Shows if the Horoscope is under the influence of Kalsarpa Yoga along with its Effects on a Person's life and the Remedies to repel the same. Features more than 500 Yogas. Now view all the Yogas, Applicable in a Horoscope along with the Cause for the Formation of the Yoga and its Effects on a Persons Life. A Graphical Display that shows the Rise and Fall of the Health, Finance and Emotions of a Month. Bhava Chalit, Niryan Cusp Etc. Rahu Kaal, Gand Mool, Panchak, Amrith sidhi Yog, Dwipushkar Yog, Swarth Siddhi Yog Etc. Check the Placement of any Planet/Houses in any Sign, Star (Nakshatra), or Degree for any given date of Past and Future. Calculates Varshphal Analysis for 150 Yrs. Displays Basic Details, Natal Details, VarshPhal Details, Harshbala, Panchvargeeya Bala, Varshesh, Muntha, Sahams, Triptaki Chakra, Analysis, Predictions Etc. Displays the Influence, Placement and Ownership of all the Planets in detail and telling a person how they have shaped his/her destiny. After analyzing the entire chart of the native, it provides personalized predictions concerning Health, wealth, Family, Property, Education, Career, Diseases, Income, Spouse, Children, Travel, Residence, Gains Etc. It provides the Complete Details of Saturn displaying its Influence on a Persons Life. It Provides the Details of Complete Sade Saati of Seven and Half Years, Its Time Periods, Effects and also the Remedies to Repel the Evil Effects. Nakshatra Phal According to various Vedic books. Stone Remedies along with the Method of Adoption, Mantras and also Recommendation of Gems according to the Problem. Effects of Mars and its Details (Manglik Vichar). Dasha Phal According to Dashas. Displays Predictions based on Maha Dasha and Antar Dasha. Predictions for more than 500 Yogas, Applicable in a Horoscope. Predictions for Kal Sarpa Yog. 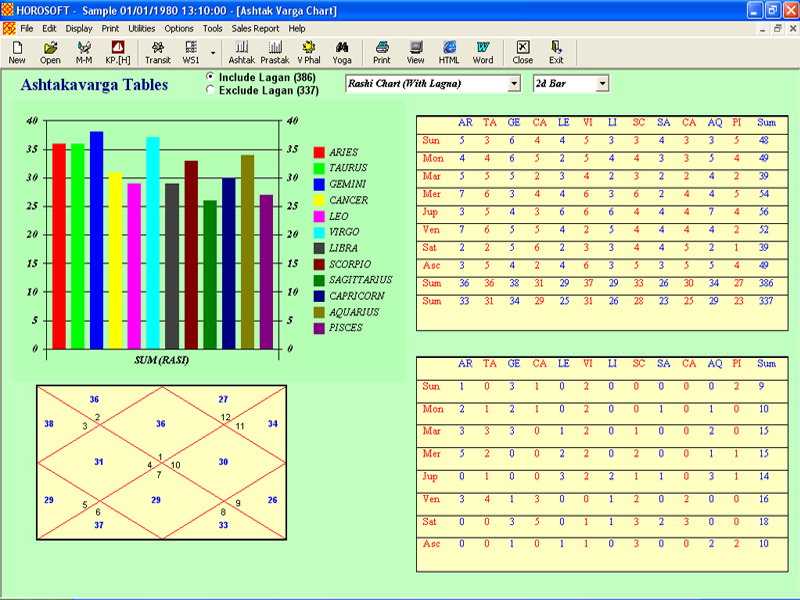 After scanning the horoscopes of male and female, the software provides accurate information of Gunas and Dosh in a graphical worksheet, as well as manglik results, conclusion and detailed Analysis. Lagan, Rashi, Nakshatra, Nadi, Varan, Vaishya, Yuja, Hansak Etc of both male & female. 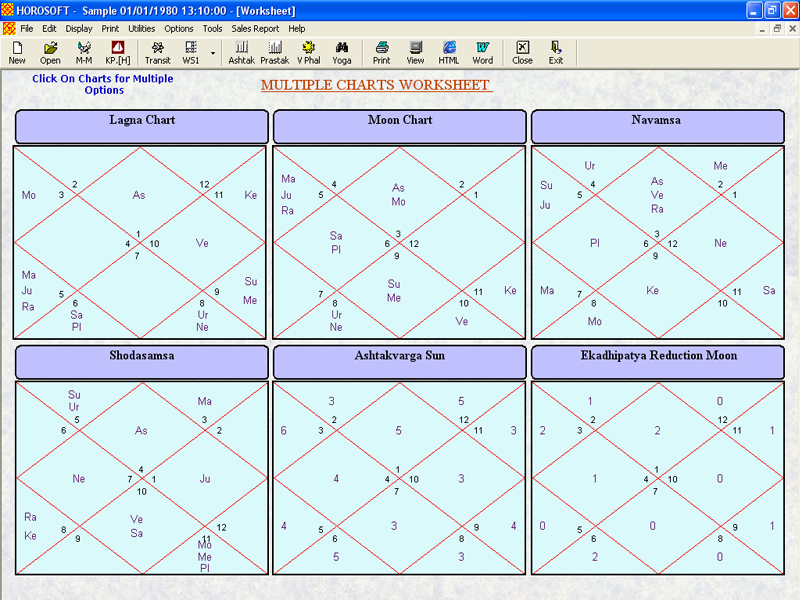 Lagan Chart, Navamsa chart, Moon Chart and Chalit Chart of both male and female. Vimshottari Dashas of both Male and Female. 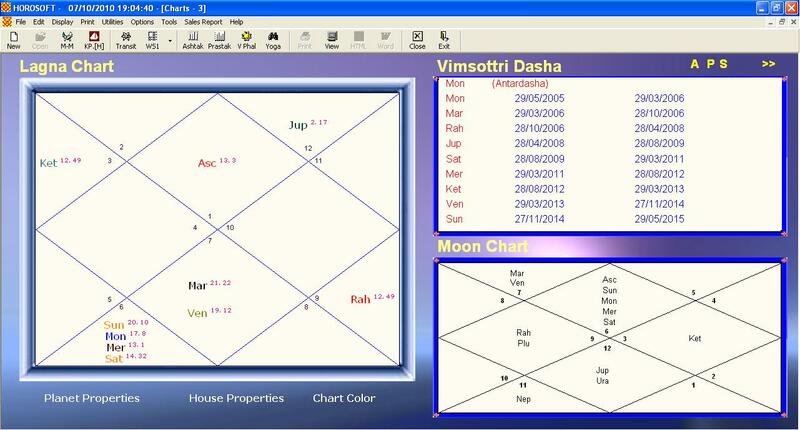 After scanning the horoscopes of the Couple, a detailed analysis of Gunas and Dosh is Displayed. Facility to save horoscopes in HTML FORMAT and directly send through Email. No need to print if you wish. Facility to save horoscopes in WORD FORMAT which can be further edited according to your choice. Facility to save different EVENTS occurred in life and view their calculations to compare the similarity between them. Facility to enter the Personal Details of a customer (Address, Phone No. Etc) and save them to be viewed for the next time. Helps determine the exact birth time of a person. 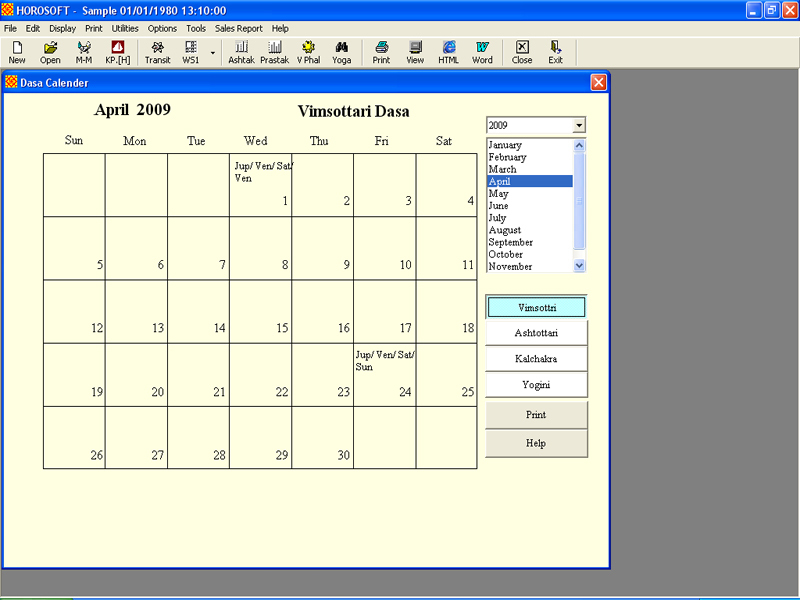 The birth chart changes on the screen as and when the Time-Tool is put into use. Write down your own comments/predictions on a horoscope. You can also take printouts and view them when the horoscope is opened again. Facility to save horoscopes in different categories. You can also search and sort the files/horoscopes accordingly. You can create your own MODULES for printing and save them for the next time. A help file incorporated in the software, which contains an entire book on astrology. This comes in handy to a learner and even to a master of astrology. This edition has an inbuilt accounting facility to prevent pilferage and maintains proper accounts as well. The system also has locking facility to prevent any unauthorized usage. You can obtain Yearly and Monthly charts by taking the ascendent as per Natal or the time entered as the ascendent. Longitudes, Latitudes and Time Zone of more than 2 Lakh cities world wide, already present in the software. You can Add, Delete or Modify the data of any city or country, which will accordingly be saved for the next time. You can view the daily position of the planets of any specific period that you desire. Allow the software to remind you of the birth dates of your near and dear ones. You can create an ascendent rising table and view when a particular Sign, Star or any Degree given by you, will enter the ascendent. You can select a group of charts from your database, based on any condition in the birth chart to segregate all people, who have a particular thing common in their charts. View the definitions and meanings of astrological words that you are unfamiliar with. A dictionary specially meant for astrology words. You can also add new words in it. You can choose the ascendent either as per horarry Nos. 1-249 or current time or you can also provide your own degree. Also prime significators, planetary position, general significators, niryana cusps, aspect Etc. In the house revolving System option, You can change the ascendent according to your requirement. You can either obtain the printouts of all the pages of K.P.Astrology or you can also convert these pages into HTML/WORDformat. 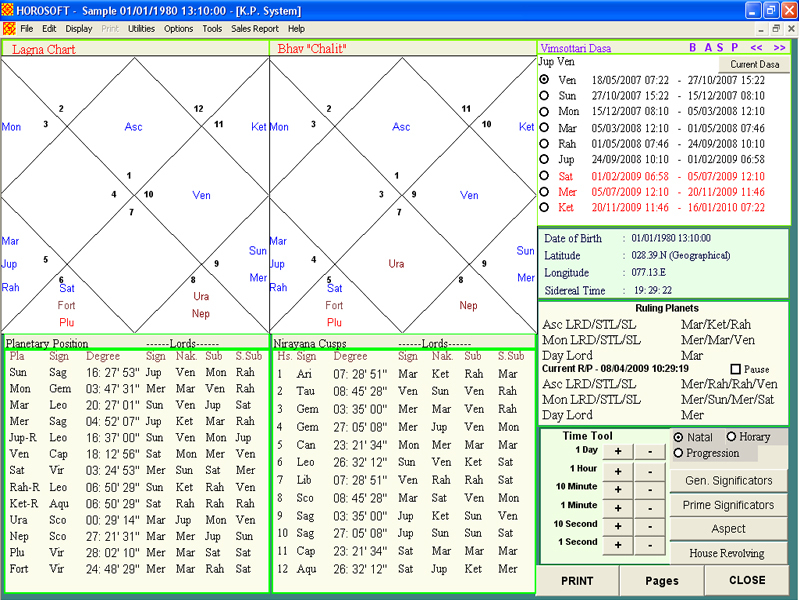 You can view both, the natal chart and the Horarry Chart simultaneously, for further analyzing the horoscope/charts. You can print the entire K.P. 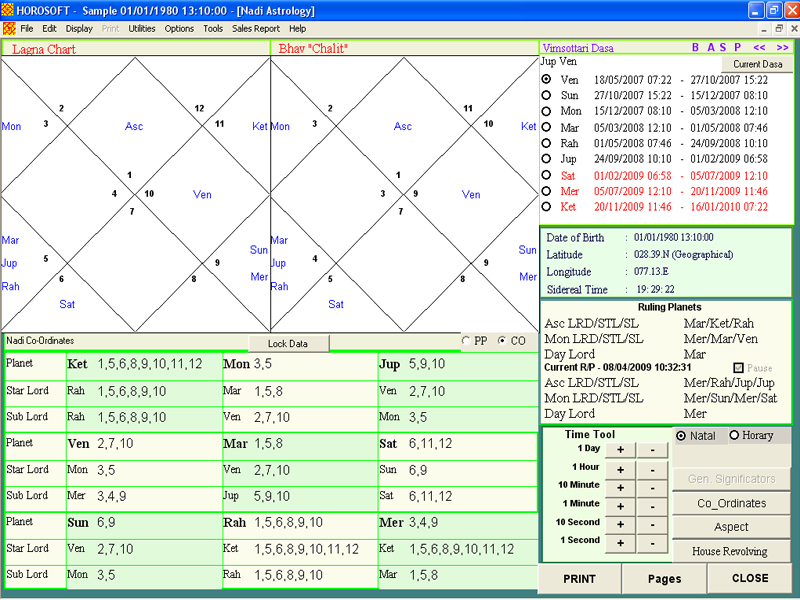 Astrology data on a single page. This saves time as well as papers. Also Co-ordinates of planets, planetary position, niryana cusps, aspect etc. You can either obtain the printouts of all the pages of Nadi Astrology or you can also convert these pages into HTML/WORDformat. You can print the entire Nadi system Data on a single page. This saves time as well as papers. Basic details, friendship table, rasi phal, lal-kitab moon chart, lal-kitab dashas Etc. View the different types of calculations in lal-kitab like dharmi teva, night-blind horoscope, minor horoscope etc with the causes of their formation and their remedies. View the different types of ancestral curse and debts like fore-fathers debt, mothers debt, unborn debt (Kanya rin, stree rin, matrarin) etc with the causes and their remedies. Lal kitab grahphal. View the predictions of all the 12 planets according to lal-kitab along with their remedies. Lal-kitab varsh kundli. View the yearly chart of lal-kitab along with the remedies to strengthen the weak planets. Remedies according to lal-kitab. Chitrapaksh (Lahiri) Ayanamsa, K.P. Ayanamsa, K.P. (New), Raman Ayanamsa, Fagan Ayanamsa, Western or Zero Ayanamsa. North Indian, South Indian, East Indian and Sri Lankan Chart Style. You can select from any of the fonts available in your Windows directory. Facility to include and exclude outer planets in the charts of the horoscopes. TRUE and MEAN position of rahu can be selected. Facility to change the astrologer name, displayed and printed at the bottom of the horoscope. You can change the color of planets in the charts. You can lock the entire software through any given password. You can now Print horoscopes in different Sizes (Both single side & double side printing). You can now VIEW / PRINT THE ENTIRE HOROSCOPE IN COMPLETE COLOR MODE. You also have the option to change the colors according to your choice. Option to change the longitude / latitude of any place in Geocentric mode. 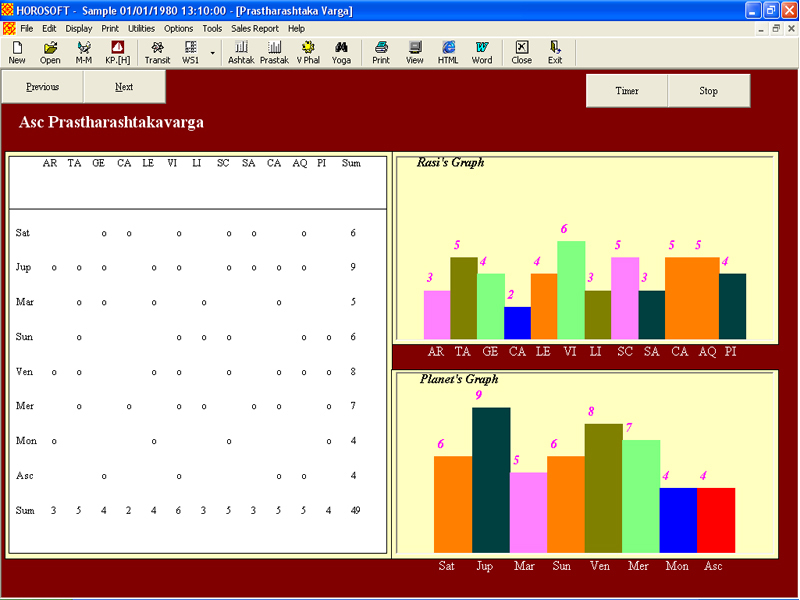 A special worksheet in which you can view 6 multiple charts simultaneously. You can change any charts you wish, and view them with other charts. Here you can view 3 charts simultaneously. You can change the color of the Planets / Degrees / Lines / Houses / Background of chart. You can also view the Details / Properties / Predictions of houses & planets here. The other 2 charts are interchangeable. A customized worksheet where you can select any chart of any size to view on the screen and can also be placed anywhere. 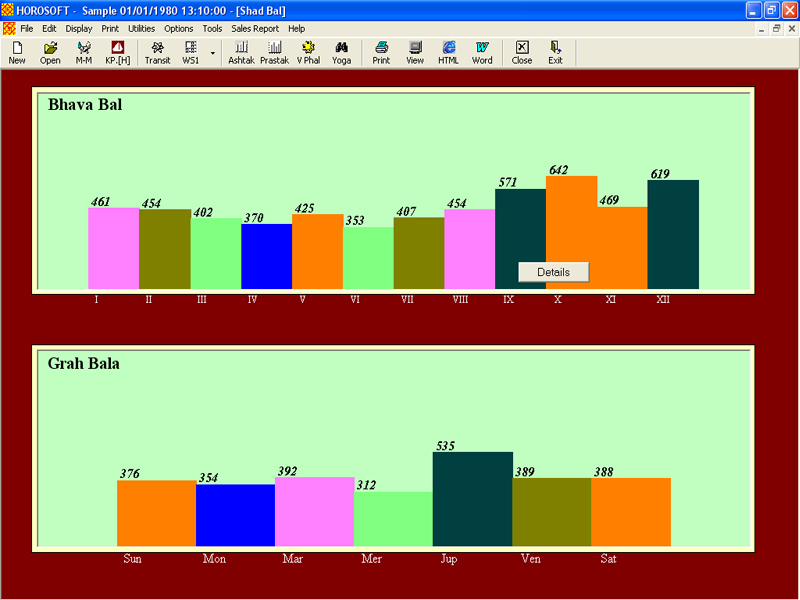 You can also insert colors in the charts, save them as a BMP File or copy it to the clipboard for further designing. An extensive worksheet on K.P.astrology where you can view the lord, sub-lord, aspects, planetary position (lagna or 1-249 nos.) etc. Also 'House Revolving System' in which the ascendent can be changed. You can also view the Horary chart from here. An extensive worksheet on Nadi astrology where you can view the lord, sub-lord, co-ordinates, planetary position, niryana cusp etc. Also 'House Revolving System' in which the ascendent can be changed. Here you can graphically view & analyze the planets and their positions. You also have the option to control the Direction/Speed of the planets, control the movement by minute, hourly, daily, weekly etc. 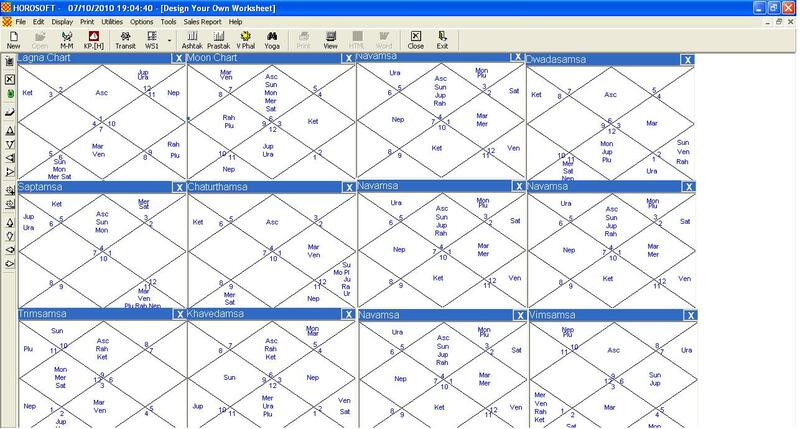 A Worksheet/Calendar where you can view the vimshottri, ashtottari, yogini and kalchakra dasha of any month and year applying on a horoscope between any specific period. Here you can view the ashtakvarga chart as in graphs (2D/3D formats) and select any type of charts. It is one of the main aspects in astrology. The dot system makes it even easier to understand the charts, Here you can view a productive chart with tales to define it, strength in graphs etc, It also has a timer facility in it. The basic way of judging six planetary strength as given in the classics. You can also view them in graph. You can customize and maintain your own modules for printing. You can restart the printing from where it has stopped, in case of a power failure or any other problem. You can obtain the printouts either from the Print Menu or directly from the screen itself. Now obtain the entire printout either in Color or in Black & White mode.